We hate 'em. We love to mock 'em. But we like to think the rivalry - heated as it can be at times - is a friendly one. So congratulations to the $quir... er, UNB Varsity Reds (nearly choked on that one) on winning the 2008 - 2009 CIS National Championship today over Western. Matt Seymour was the heart and soul of the Tommies for the first 3 years I was there. He was very entertaining to watch and scored timely goals and wasnt afraid to go after the bigger players in the league for the puck with bodychecks. The Seymour show was in last years playoffs with the injury to Jeff Bateman when Seymour got to be on the top line with Bowers and Bourbeau. In 5 years, Seymour scored 28 goals, 37 assists, 65 points and 192pim. Seymour is the classic little dog in a fight, but was tough as nails. Bateman on pure skill was the best player, coming from a pro career with the Utah Grizzlies of the AHL and the Lexington Men O'War in the ECHL. Jeff had a tough first season being a target of the other teams because of where he came from. Not to mention he had injury difficultes, ending his STU career at the Aitken Centre during the UNB Holiday Tournament. Bubba always was on the top line and used his abilty to find open players with a great passing and shot for some big goals. Jeff scored 23 goals, 51 assists, 74 points and 102 pim. 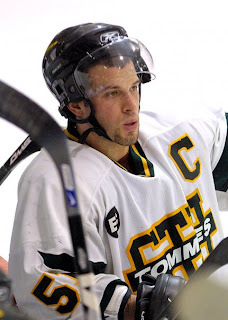 Bateman worked really well with Bourbeau and Justin Bowers on the "Killer B" line that won a lot of games in the 2006-2007 and 2007-2008 season, putting up huge numbers for STU. Well, I am back. I figured since I was thanked as a blogger I might as well say thank you to STUTommies.com for all his hard work bringing us the news and information on the team. Say what you want about Theriault, he is not a popular person when it comes to hockey. BUT, he was a force when it came for the Tommies, even risking damage to his knee in his last season in a last ditch effort to get the Tommies to Nationals in the last chance series against ST.FX. Nick got 19 goals, 37 assists, 56 points, and 241 penalty minutes. Nick had a phenomenal shot from the point where it would always find a hole through penalty kill coverage, and even tho he was 6'4", and a LISTED 225, he would skate fast for a bigger player. He had a knack for being a troublemaker, and there is some evidence about that, but he was a great player for the green and gold. I did not have any action shots about Thatcher Bell for some reason, but that does not mean Bellsy was in a crowd when it came to playing for STU. He was injury rattled his first 2 seasons, missing 29 games in those years. But he was a great linemate to Kyle McAllister and was benefitted by some plays by Macker. 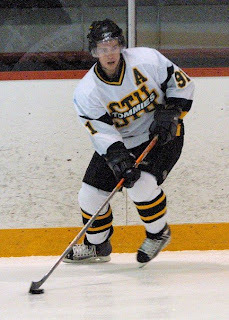 A great skater, Bellsy could wheel and was not afraid to go into traffic for some goals, including his OT winner over St. FX in 2006-2007 when he was on Danny Battachio's doorstep for the winner. Bell scored 21 goals, 36 assists, 57 points and 24 pim. I like to call Bell the "2nd Best Player from Murray Harbour, PEI" with Brad Richards being number 1, but thats not to say Bellsy was a hockey talent. I will be back after the weekend I do believe. Its my birthday tomorrow and UNB intramural hockey playoffs on saturday so I will be quite distracted with that. But sunday should be the day where #4 and #3 will be revealed, then #2 with an honourable mention list (which if I did not throw my list out in the garbage cleaning my room) then #1. I want to hear from you guys via the comment box what your top 5 players are! 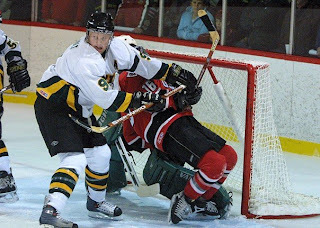 With the 2009 University Cup starting in Thunder Bay this week it means that the 2008-2009 CIS hockey season is coming to an end. While this year's version of the men's Tommies didn't have a banner year, our Lady Tommies had a strong record setting year. With that, we would like to say a few sincere THANK YOUS to all of you who take the time to visit us at here at stutommies.com. First and foremost thank you to our two great hockey teams, who without them, we would have no one to cheer for. Thanks to Coach Eagles and Coach Murphy for all the hard work they put in behind the bench and behind the scenes. Most of what they do goes unaccounted for but we know. Thanks to all the volunteers and coaching staff that help make the day to day stuff possible. Great work. And thank you so much to our student athletes of St. Thomas University for putting your blood, sweat, and tears on the ice game in and game out. We appreciate it. Thank you goes out to the media who covers University hockey here in Freddy Beach. Thanks to Randy Corey, the DeCourcey boys, and CKTP for covering our Tommies. What a step up it has been since the days of having to listen to UNB fan #1 doing interviews of STU players. Thank you to Bruce Hallihan, Bill Hunt, Mike Power, and Dave Ritchie at the Daily Gleaner for all of their hard work. What would this site be without you? From the regular articles and features to commentary that gets people talking, thanks. A big round of thanks to our special guest posters this year. Randy Corey, Jason Cassidy, and Fraser MacAlpine. Thanks for supporting us with great content and interesting pieces. Honestly, we can't gush enough praise on these three gentlemen because their contributions were GREAT. Thank you. Steak and a beer, our treat. I want to deviate a little from the "norm" and thank our Squirrel friends. We love to hate them but the truth is, it wouldn't be any fun without them. They have a great new site at unbhockeyfans.com that complements us here at stutommies.com and we look forward to some interesting rivalry fun in the future. Fredericton fans love their CIS hockey and our passion shows. Another surprising thank you (coming from us that is) has to go out to vredshockey.com. While we would love to grab all the accolades of being the first CIS "fan site" out there, it wouldn't be true. vredshockey.com was bringing game recaps and information to the CIS hockey fan before the majority of us knew what the Internet was. They are the motivation behind our site and we aspire to your level. Of course in typical Tommies fashion we wanted to beat you "dirty Squirrels" or by God, die trying. Thanks. To all of you fans, Tommie, Squirrel or otherwise thanks for reading. We do have a little surprise for you die hard Green and Gold supporters in the next couple of weeks. Plus the new recruits will be coming in the next several months, so stay tuned. Well, after some hiatus and the fact there isn't any news to put out other than the usual "UNB Rulez, STU Suckz" and vice versa, I have decided to rekindle the Top 10 STU Tommies from the past 4 years as a change of pace. And I apologize for not doing this earlier, I got caught with homework and other things (like not being able to sign in) until Jeff Bateman reminded me via facebook when the top 10 was starting back up...so here we go! I only saw Emily play a handful of games, but she was dynamite. Especially 2 years ago at Atlantic's when STU was only 60 minutes away from making a Nationals Appearance. Hobber split time with Lindsay Coughlin and Liette Arsenault throughout the season, but near the end of the season, she took the #1 job going into the Atlantic's. She defeated Dalhousie in round 1 and in the greatest playoff performance for a goalie in the past 4 years, she should have been arrested for theft because she stole the game from #1 ranked ST. FX. She made some amazing saves in the game, especially stoning Jessica Boudreau point black with 5 seconds left. The finals versus Moncton was not her fault as she tried to keep the game close but ended up losing in the end. From the way this season went for the ladies, Julia Sharun looks like the next Emily Hobbs as she stole games this season as well. Butera was a rock on defense for STU for 3 seasons and the captain in his last. It must have been hard for him to wear the C after Kyle McAllister graduated, but Butera was awesome in his role to settle the team down. Butera only missed 3 games in 3 years and gained 9 goals, 46 assists and 55 points with 145 pim. Butera played very well on the power play with his regular partner Paul Giallonardo and they worked like a well oiled machine. Butera has a great introduction to the Battle of the Hill as he got into a fight with Stacy Smallman from UNB. Butera was a great defensemen and was greatly missed this season. An interesting article from Wednesday's Globe and Mail, with some insight into how the CHL scholarship program works, and the issues major junior players face when making the choice between turning pro or choosing to pursue their education. (Purely coincidence that former $quirrel Darryl Boyce is featured in the article). Between 400 and 450 players finish their Canadian Hockey League junior careers every year, and all but the elite few — those who do not go on to the NHL immediately — reach the same crossroads as Boyce. Do they continue to play wherever they can find a paycheque as a pro, or shift focus and head to college or university? The CHL's scholarship program has made that choice more difficult. Over the past 20 years, scholarships have evolved from small, inconsistent financial awards from individual teams to standardized, league-sponsored packages. Former St. Thomas Tommies forward Justin Bowers is producing in the AHL. Friday night he helped the Quad City Flames to an important victory scoring the winning goal on his way to his first AHL hat trick. AHL goal of the season and put the Flames ahead 4-3 after two periods. Way to go Justin! Entire Quad City Flames release. If not for a 2 minute stretch at the end of the first and beginning of the second period things might have been different. It wasn't to be this year but the Tommies have nothing to hang their heads about as it proved they are a team on the rise. St. FX started the scoring 19:36 of the first on the PP and out shot the Tommies 13 to 6 in the period. Christina Davis was credit with the goal. Just 30 seconds into the second Brayden Ferguson scored and 32 seconds after that Carolyn Campbell scored to give X a 3 goal cushion. Catherine Bourdeau scored at 15:19 of the second with assists to Nicole Dube and Kelly Matthews but this was as close as STU could get. 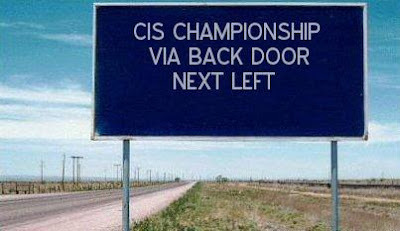 The X-Women shut the door the rest of the way and will face Moncton in the finals tomorrow afternoon. Julia Sharun was strong in the St. Thomas net facing 28 shots while the offence could only muster 12 shots the other way. Many firsts were achieved this year by the Ladies and we look forward to a promising recruiting season and 2009-2010. The St. Thomas Tommies are moving on to the second round of the AUS play-offs after a tight 1-o victory tonight over the home town UPEI Panthers. AUS All-Star and rookie of the year Julia Sharun picked up the shut out win facing 27 shots. The sixth seeded UPEI team came out hard in this game and really pushed the third seeded Tommies all night. Lyse Rossignol picked up the winning goal at 4:22 of the first period unassisted and that marker held up. St. Thomas out shot the Panthers 29 to 27 overall. Three goals were called back in the third period because the net had dislodges from the post. Julia Sharun was the player of the game. The Atlantic conference Rookie of the Year is St. Thomas Tommies goalie Julia Sharun. In just her first year with the St. Thomas program, Julia, a native of Edmonton, AB, appeared in 21 games, posting a 14-7 record and a 1.71 goals against average. Her season included a two shutouts and her 0.935 save percentage was second only to UdeM's Desjardins this season. saves were the most by any goalie in the AUS. named the AUS Rookie of the Year and will look to become just the third Atlantic conference player to be selected as the CIS Rookie of the Year. The Tommies begin the play-offs tonight against host UPEI at 7PM. If you would like to send your Best Wishes to the team, you can do so by leaving a message at the Rodd Royalty Inn and Suites in Charlottetown. Or please feel free to leave a comment below and we will pass it along. The AUS has released their 2008-2009 conference All-Stars and All-Rookie team and 3 Tommies are included this year. 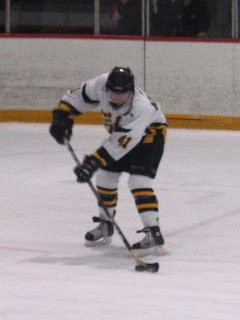 Lucrese Nussbaum was named to the 2nd team All-Stars for defence. The Weinfelden, Switzerland native was a rock on the Tommies blue line all season long. She played major minutes and in all situations. "Lukey" was a +12 on the season and had 8 assists. As most of you Tommie fans know, this young lady will be playing defence for her native Switzerland in women's Ice Hockey at the 2010 Olympic winter games in Vancouver. She will also be representing St. Thomas University and the Tommies. We are very proud of Lucrese. Julia Sharun was stellar in the Tommies net this season. The Edmonton, Alberta native set a team record for wins in a season(14) and continued the strong tradition of great goaltending at St. Thomas. Julia was named a second team AUS All-Star, as well as being named to the All-Rookie team. She lead the league in saves and minutes played. She was second with an impressive .935 save percentage, wins (14) and shut outs (2). Sharun is a strong competitor and her drive to get better will serve the Green and Gold well in years to come. Kayla Blackmore had a great rookie season with the Tommies lighting the lamp 10 times this season. This Fredericton High School product stepped up when ever she was needed. She does more than just plays hockey as is demonstrated by this article. Kayla had a great season and got the nod on the AUS rookie team. Miss Blackmore, and the rest of the Tommies for that matter, are really focused on the AUS championship this weekend at PEI and are looking to get the Tommies to their first CIS Nationals. Congratulations to all of our Tommies All-Stars. For the AUS media release please check here. The Lady Tommies finished their record setting regular season with a win in Sackville this evening against the Mount Allison Mounties. On the strength of five goals in the first two periods the Tommies coasted to a 5 to 1 victory. STU opened the scoring at 5:08 of the first period on a goal by Caroline Hammerheim with the assist to Ashley Duguay. Forty one seconds later Lyse Rossignol padded the lead on an unassisted marker, which turned out to be the eventual game winner. The Tommies controled the play with a 9 to 2 shot edge in the first. Sackville native Jilian Coughlin did most of the damage in the second period scoring her team leading 11th and 12th goals of the season. She scored her first of the night at 7:37 with assists to Rossignol and Bernier. Her second was scored at 11:16 with Dominique Bernier getting her second assist and Micheel Goguen drawing the other helper. The Tommies finished off their scoring at 17:52 as Bernier scored for her third point of the night. Lyse Rossignol picked up the only assist for her third point. The Mounties broke up Julia Sharun's shut out bid at 10:56 when Heather Morgan scored on the power play. Final shots on goal favoured St. Thomas 36 to 14. With the win Sharun has 14 wins on the season, a team record. The Tommies enter the play-offs as the third seed and start their run at an AUS Championship next Friday night at 7PM against the host UPEI Panthers.